Saudi-led Coalition Launches Surprise Attack On Key District South Of Al-Hudaydah (+18 Video) 3.1428571428571 out of 5 based on 7 ratings. 7 user reviews. On August 12, the Saudi-led coalition and its Yemeni proxies launched a surprise attack on the Houthis’ positions in the district center of al-Durayhimi along the western coast of Yemen, according to the Sky News Arabia TV. While Sky News Arabia said that the Saudi-led coalition besieged al-Durayhimi, the UAE-based al-Arabia TV reported that the coalition managed to capture the district center only few hours after the beginning of the attack. The TV channel added that coalition forces captured more than 100 fighters of the Houthis. Two months ago, the Saudi-led coalition launched a similar attack on al-Durayhimi and captured several key positions around and inside it. However, the Houthis repelled the attack and recaptured all the positions within few hours. Al-Durayhimi is located only 20km south of the coastal city of al-Hudaydah, which makes it vital for the success of the ongoing operation of the Saudi-led coalition along the western Yemeni coast. The operation is aimed at capturing al-Hudaydah and its strategic port. ”HOUTHI FIGHTERS BREACH SAUDI BORDERS AND TAKE OVER MILITARY POSITIONS. According to CIA vermin like Daniel Hoffman, the Houthis aren’t allowed to fight back, taking the fight to Saudi Arabia is ‘escalation’, that guy really pisses me off. I know… it’s never about oil. 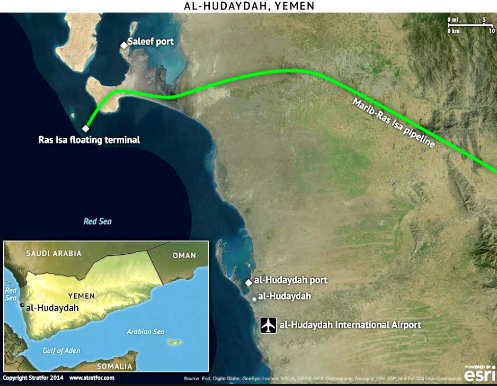 But the Marib (Safar) to Ras Isa pipeline is probably a much bigger prize to Hadi, Saudi head-choppers or the UAE monarchy than the broken-down port of al Hudaydah. Feeding Yemenis? Where’s the profit in that? 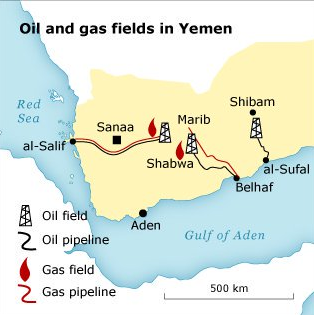 Ras Isa has a 26″ pipeline feeding it from the al Safer oilfield near Marib. Well, did. The Marib Refinery and Yemen’s largest commercial oil field in al Safer, oddly enough, were one of the first things AQAP went after a few years ago. Hadi loyalists (with some U.S. and Saudi help) beat back AQAP and control them now, but they can’t export crude through the pipeline to export via the Ras Isa terminal because the Houthis own that part. That makes Hadi (and his genocidal backers) very angry. They’re losing money every minute the pipeline is closed. And the Houthis said a few months ago they’re going to drain the pipeline and Ras Isa crude in floating storage and sell it – maybe a million or two barrels. Not sure where they’re at with that plan. In any case, draining the pipeline will make it start corroding and buckling, so some Houthi kids are going to have to die to prevent this. The grifter Hadi (and Saleh, too) made a fortune skimming oil export revenue. That pipeline simply must be reopened, no matter how many Hadi loyalists (the ones that haven’t deserted yet) it takes.